PLANE SIGHT Tinted Visors are a totally new product that can make your flying safer and more enjoyable. Designed by a pilot for pilots, PLANE SIGHT Tinted Visors can greatly improve your cockpit visibility over solid visors, yet still give you valuable protection from the sun’s glare. PLANE SIGHT Tinted Visors are unlike any other tinted visor currently available. They can be installed in minutes using the original aircraft hardware. PLANE SIGHT Tinted Visors can be fitted to most experimental aircraft, most popular Cessna singles (1979 and earlier); AND Beechcraft singles and twins produced after 1970. Please refer to the application chart for more details. PLANE SIGHT Tinted Visors are made in the USA with the finest materials and attention to detail. Your Satisfaction is guaranteed. PLANE SIGHT Tinted Visors represent a commitment and investment – Your commitment to increased safety through greater visibility; and YOUR investment in improving the looks of your aircraft. PLANE SIGHT Tinted Visors are a winner on both counts. PLANE SIGHT Tinted Visors are a plain sight better than stock visors. Using Plane Sight Tinted Visors can greatly improve your visibility in the cockpit. As you know, when you lower your stock visors, they rob you of at least one square foot of valuable and limited windscreen viewing area. For many aircraft, losing a square foot of viewing area can be like blanking one third of the windscreen. PLANE SIGHT Tinted Visors recover that lost viewing area so you can continue your scan for traffic and still shade the sun! When Plane Sight Tinted Visors are used instead of conventional solid visors, traffic is easier to spot, and that may help make us safer pilots. PLANE SIGHT Tinted Visors give your airplane interior a real facelift, and really brightens the look of the cockpit. Lets face it, most of the private aircraft fleet these days is a little long in the tooth. Even most refurbished interiors seem to forget the visors. PLANE SIGHT Tinted Visors are quality products that really spiff up the inside looks of your airplane. The textured powder coating applied to the visor mounting hardware compliments most interior colors. Plane Sight Tinted Visors stand out as quality aircraft accessories you will be proud to have in your airplane. PLANE SIGHT Tinted Visors are quality manufactured of the finest materials. Each Visor Mount is fabricated from 6061 T-6 aircraft aluminum and steel tubing. The aluminum is anodized and the steel tubing is plated for durability and corrosion protection. Each visor mount is riveted with aircraft grade rivets, then powder coated for maximum protection. PLANE SIGHT Tinted Visors are fitted with dark Bronze tinted acrylic visor panels. Each visor panel is machined with a proprietary process that gives it an ultra smooth edge. PLANE SIGHT Tinted Visors directly replace your stock visors. You can install Plane Sight Tinted Visors on your airplane in just a few minutes time with nothing more than a plain screwdriver. PLANE SIGHT Tinted Visors require no special preparation for installation in your airplane. Plane Sight Tinted Visors use only stock aircraft visor mounts and in no way modify the airframe. PLANE SIGHT replacement Tinted Visor Panels are available in sets, and are easily installed in the mounting hardware with just a screwdriver. Two models of Plane Sight Tinted Visors fit most Cessna Singles built before 1979. 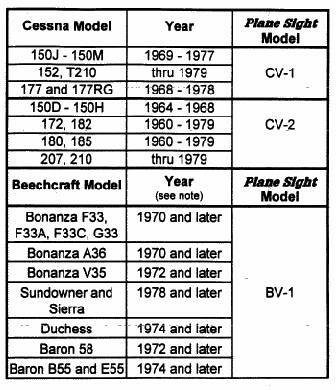 A third model fits Beechcraft Singles and Light Twins built after 1970. NOTE: the BV-1 will fit on most earlier models of Beechcraft with a visor mount changeover. We can exchange your stock visor mounts for compatible hardware for a small additional fee of $69.75. PLANE SIGHT Tinted Visors are guaranteed to please you or your money will be refunded. If you are not happy with them, return the Visors and product materials within 30 days for a complete refund. PLANE SIGHT Tinted Visors have a full warrantee. Mounting hardware is unconditionally guaranteed for 3 Years. The acrylic visor panels are guaranteed against cracks or breakage for 60 days. PLANE SIGHT Tinted Visors are priced at only $149.95 per set, plus shipping, handling, and any applicable taxes. Cash, Money Orders, Visa and Mastercard are accepted for payment. Send mail to customerservice@dorcliff-aerocrafts.com with questions or comments about this web site. Copyright © 2005 DORCLIFF-AEROCRAFTS, LLC.